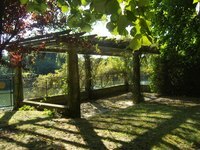 A pergola is a structure that provides shade over an outdoor area. Grapevines (Vitis spp.) are ideal plants to grow over a pergola because they have a natural inclination to climb. Once established, a pergola draped in grapevines provides green, leafy shade, while the clusters of grapes hanging from the structure add exotic beauty. Hardy from U.S. Department of Agriculture plant hardiness zones 3 through 9, grapevines are available in pots with soil at nurseries. Mail-order sources usually ship grape vines bare root with the roots wrapped in cloth or other moisture-retentive material. Add one to two shovels per plant of rotted organic matter such as leaves, compost, or manure to amend the soil in the planting area next to the pergola. Work the organic material into the soil using a garden spade or fork. Dig out a planting hole 6 inches from the side of the pergola. Make the planting hole as deep and slightly larger than the root ball of the young grapevine. If the grapevine has arrived bare root, trim off any dead or diseased looking roots. Plant the grapevine in the mid to late winter in warm climates or early spring in cooler zones. Remove each grapevine from its nursery pot and place it in the planting hole so that it is the same depth in the soil as it was in the planting pot. If the vine is bare root, spread the roots out in the planting hole so that they are not twisted back. Fill in the soil, pressing it down as you go to press out air holes. Water after transplanting and for the first year after planting to keep the soil damp. After the first year, grapes need water only in severe drought conditions to supplement natural rainfall. Prune the grapevines right after planting. Use a sharp pair of pruning shears to remove the top third of each cane. Remove any suckers or offshoots from the plant. To prevent the spread of disease, disinfect your pruner blades with household disinfectant before and after your prune. Remove all but one or two strong vertical canes to begin training the grapevines to grow over the pergola. Screw an eye bolt into the pergola at the level of each cane. Attach the canes to the eye bolts using anti-rust wire. Begin this training the year following planting between January and March while the vine is in its dormancy period. Prune the vines each year between January and March by removing any canes that are growing away from the pergola. Attach canes to the pergola using eye bolts and wire. Broadcast 1/2 cup of 10-10-10 granular fertilizer around each vine at planting, and repeat monthly until midsummer. In the second year, use twice the amount on the same schedule. For mature grape vines, increase to 1 pound per application. Water the area thoroughly each time you fertilize.